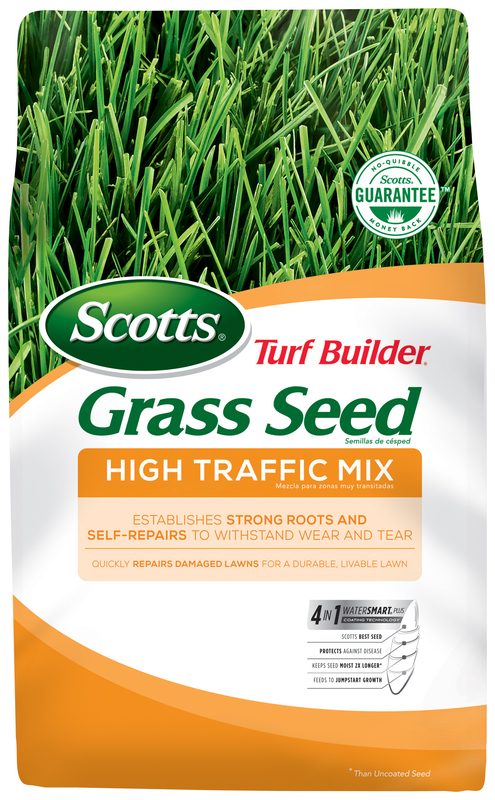 Scotts® Turf Builder® Grass Seed High Traffic Mix establishes strong roots and self-repairs to withstand wear and tear. It quickly repairs damaged lawns for a durable, livable lawn. Scotts wraps each seed in a unique 4 in 1 WaterSmart® PLUS Coating that absorbs 2x more water than uncoated seed, feeds with essential nutrients, and helps protect seedlings from disease. Grow Quicker, Thicker, Greener Grass. Guaranteed. Grows quicker, thicker, greener grass guaranteed! - Set to 4 for Reseeding and for new lawn/bare spot repair, go over lawn twice.